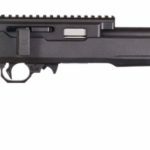 The Volquartsen Summit bolt action 22 LR is based on a concept originally developed by Primary Weapons Systems. It represents the combination of their innovative design and the 40 plus years of Volquartsen’s own rimfire experience. 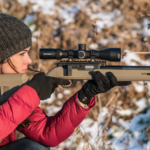 This rifle has been designed for both competition shooting as well as small game hunting, this unique rifle is a straight-pull bolt action inspired by the 10/22 style platform. The CNC-machined receiver features an integral 20 MOA Picatinny Rail, making it the perfect rifle for any rimfire long range shooting. The Summit is built using our lightweight carbon fiber barrel. It features a muzzle threaded 1/2 x 28, making it the perfect companion for your favourite suppressor. It doesn’t get much quieter than a 22 LR bolt gun suppressed! This innovative design is built for everyone from the junior just getting into shooting to the accomplished competitor.